Do not leave the emergency to chance: With Emergency ID, you are prepared for any medical problem. Thus, no valuable time passes for your necessary treatment. The rescue workers quickly learn about pre-existing diseases, allergies and other relevant data. The emergency strap will carry you comfortably on your wrist. With the access code on the Tag, the rescuers get quick and easy access to your anonymously stored medical data in the online emergency pass or emergency app. The emergency card, stored in a purse, delivers the most important information on an ad-hoc basis while providing access to your detailed emergency card on the Internet. 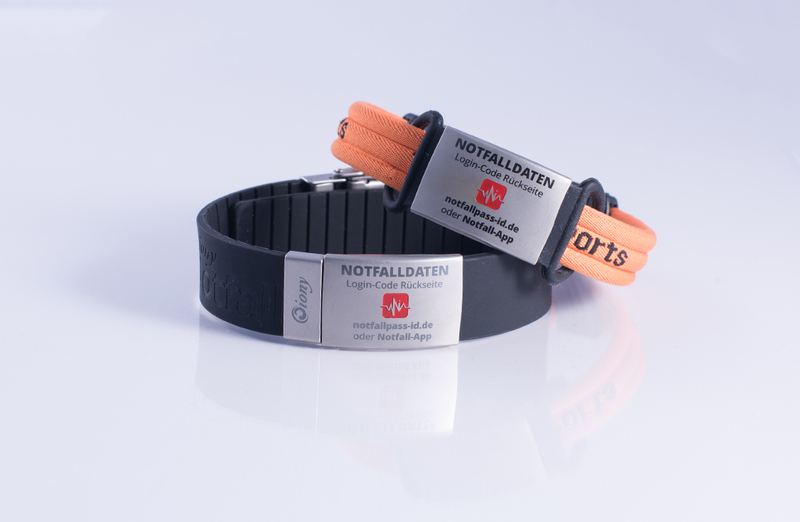 An effective protection in itself, together with the emergency bracelet an unbeatable combination! 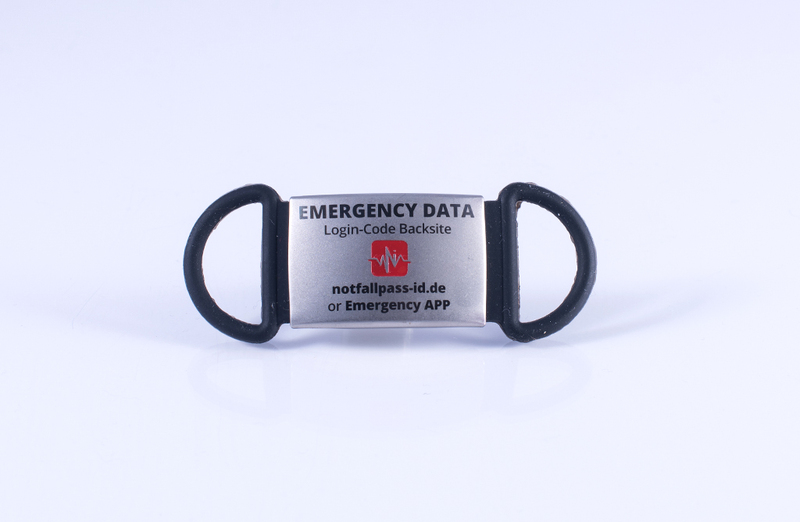 The emergency tag offers a flexible attachment to various bracelets such as watches or tracking bracelets.As well as many other products such as bags or rucksacks.So they are equipped in any situation.A lot of other emergency tags can be found in shop. Free emergency pass and emergency app, the combination with many advantages. Emergency ID Code. Please enter your emergency passport with your email address. Here you can create your emergency pass online. Your profile is now assigned to the emergency ID code. You can also save the created profile into our emergency app. Emergency App Download in the Google Playstore. The emergency app provides a second relapse level when the Internet is not available. In everyday situations situations arise quickly, in which you need medical help, whether it is an injury to sports, a traffic accident or a breakdown of the circulation. But the rescue workers are regularly confronted with a problem: in order to treat you adequately, they need information about your medical history, existing illnesses and allergies or medications taken. If you are no longer approachable, therefore, survival-critical time elapses. Incorrect decisions regarding the emergency measures taken can also result. Emergency ID can not prevent you from accidents. But make sure that rescue workers can handle you in the best possible way. They enable paramedics, emergency physicians, firemen and other helpers to save your life if you can not do it yourself. In short, if your helper opens this profile, he immediately learns everything he should know about your treatment and beyond. You can also save medication plans as well as pictures as a scanned document. The care of the emergency pass is possible from any device with Internet connection, whether computer, laptop, tablet or smartphone. To do this, simply call the online portal, register with your e-mail address and a password and store the desired information in your profile. Here, the full anonymity is ensured, since no personal data is recorded in addition to your e-mail address. Access is only possible via an emergency ID code number. The app can also be blocked by a PIN query so that the data is not accessible to unauthorized third parties, the smartphone should be lost. Please refer to the purchased article and enter it into the app. In an emergency, however, the rescue personnel can easily access the app, even if the mobile phone itself is locked. You can use a widget on the lock screen to access the PIN query. These PINs are read by your helpers on your emergency armband or emergency card. Once they are entered, they are forwarded directly to your medical data. the app profile, as well as the hint where the medical data is to be found. In an emergency, immediate access is thus possible and thus even faster handling is possible. The emergency bracelet Sleeves of Emergency ID are both decorative and useful at the same time. The fibers of silicone, sail, germanium and titanium are interwoven into a fine, high-quality fabric, which is characterized by its longevity and high wearing comfort. They are available in many colors. The emergency ID tag is made of sturdy stainless steel and can be attached to the bracelet (eg on the shoe, on the backpack or on your own jewelery). The product is rounded off by a secure, yet easy-to-open click closure. Possible concerns that emergency bracelet might not be perceived in the event of an emergency are unfounded. Rescue workers are dependent on additional information about your medical history. Once you discover the bracelet, you will have the chance to get your data. On top of that, the wrist in case of unconsciousness usually has to be examined anyway in order to give you blood pressure or an intravenous access. Thus the emergency bracelet is discovered directly. Due to the growing degree of dissemination, the rescue workers are often the first to look at the wrist. Information on the emergency card: On the back, you will find the most important illnesses, allergies and medicines that are relevant to the emergency, with a water-resistant pencil. These are valuable preliminary information for the rescue personnel. NFC feature: With each smartphone, the emergency card can be read out. All you have to do is activate the NFC function on the mobile phone of the rescuer and place the card on the mobile phone. The rescuer will automatically be forwarded to your online emergency service, where your medical information can be retrieved down to the last detail. App-Code: The emergency ID app stored on your own smartphone can be backed up by a PIN code. You will also find this on your card. This allows the rescue personnel to access the most important medical information even if there is no internet connection for calling the online emergency pass. Whether the emergency bracelet or emergency card is better suited to you depends on your personal preferences and preferred activities. In particular, an available Internet connection is an important selection criterion. The emergency card has the advantage that you almost always have the purse in it, so you do not have to worry about it because you do not even have to carry your mobile phone. However, the emergency passport coupled with it requires an active Internet connection, which is not always available during sporting trips to open terrain or possibly even in closed buildings. Athletes often prefer the emergency armband because it does not interfere with running or cycling and you can leave your wallet easily at home. To open the app, you need to have the smartphone with you. However, this is the case in most sportsmen anyway, in order to listen to music or remain accessible. The big advantage: The combination of emergency barb and app works even without Internet connection. Your best for more safety: Combine all four pillars to ensure maximum safety. For example, your medical data is always accessible through the app or through your online emergency pass and your rescue is on your feet.